The rush to pay tribute to cosmological colossus Stephen Hawking had an air of reflex about it. People paid their respects, but many were not entirely sure why. He'd be missed, but in what way? 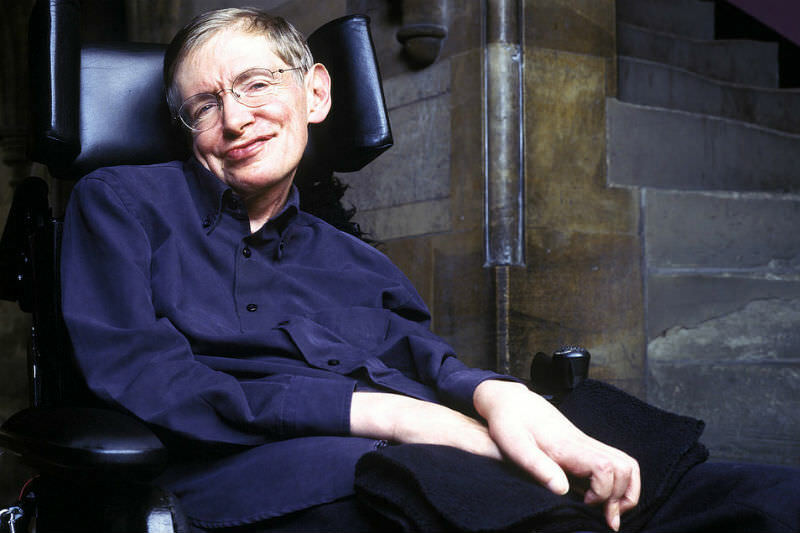 "The Hawking outpouring is a reminder that human societies seek saints. The incurable paradox of sainthood is that individuals who observe it rarely know much of the figure." Hawking didn't let misfortune call the shots in his life. He was a true eccentric too. That's a fine way to be remembered. I suspect Stephen Hawking, now sainted, has been having a great time over the past few days. Perhaps the conversation went something like: Welcome aboard Stephen. I must say that it is a pleasure to welcome you to my communion. I was very impressed by your efforts to reveal the greatness of my creation and I must say that you came close, but not quite close enough, to the truth. But you tried and used the talent I gave you and I didn't expect anything more than that. Let me take you on a tour of the establishment where everything that occupied your intellect on Earth will become so much clearer. Don't be too dismayed if you don't immediately understand everything that I will show you. Sometimes even I find it incredible even though I designed it! And, believe me, I'm not a particularly big-headed fellow - I abandoned such human traits when the humans crucified me in the personage of my son. But I must warn you. What you will see will confound even the remarkable intellect I gave you and I know that you will be champing at the bit to go back and reveal what I am about to show you to all those dons and scientists who paid homage to every one of your strangely processed words. But Stephen, you can't go back and that is just as well. Because if you reveal the galactic truth of my universe they will not believe you and will ridicule and persecute you. Look what they did to me despite seeing some of the extraordinary things I did when I joined them temporarily on Earth. But not to worry, you will be very happy here and there will be much to occupy your mind. Come now and I will show you what's on the other side of that black hole over there. I must say that its great to see you free of that wheelchair now and able to speak to me with the voice I gave you rather than through that electronic gismo the human healers gave you. Come on, then. Let's go! Thanks, Binoy - good to get such a gently probing article on the subject. There would be those who idolize SH(saintify him) because of his inimitable way of dethroning issues of religious faith and belief. All grist for the mill in these days of adventurous bric-a-brac about who we are, how we got here and where we are going. Early last century the notable Jewish German philosopher Martin Buber was writing against what he termed an 'age of alienation'. He also posed his critique of what he called 'outworn images of God'. So, in a way thankyou, Stephen,for your stirs. We believers do need to move on, ever reluctantly so, to grasp the Pauline horizons of Ephesians 3:18. More than the things he got right in science was his readiness to stick his neck out and make the odd mistake - and acknowledge it when that turned out to be the case. At least in my experience, science is supremely a social enterprise, and is not about the lonely genius caged in either by unpopularity or physical suffering, but about one's pig-headed obsession with ferreting out the unconscious prejudices on one's own work (before going after the mote in another's). This Hawking did, by and large, in his science; and for the good of posterity this is what matters. I didn't like or agree with everything he espoused. But I had enough nous to listen. Was he a saint? No more or less than the rest of us still scrabbling around to achieve something like decency. And no saint has ever been perfect, for which we may thank God; there's hope for us all. Thank you Binoy Kampmark for your article about Stephen Hawking. I suspect, however, that Hawking would be the first to deny he was a saint if he knew that people were describing him so! He, of course, was a brilliant physicist and leading researcher of the cosmos and he had the ability to inspire the general public’s interest in this. The facts that he lived to 76 years and had a brilliant career despite being diagnosed with a crippling disease at an early age, was told that he would die within three years and had to rely on a wheel chair and a speech synthesiser have added to his appeal. Recently, I read that Michio Kaku, a professor of theoretical physics at the City University of New York, said that not since Albert Einstein has a scientist so captured the public imagination and endeared himself to tens of millions of people. I am sure that both men were very popular because of public interest in new scientific discoveries. They both had difficulties in life. Albert Einstein had to escape Nazi Germany because of his Jewish background.. And both scientists championed progressive causes and both had the ability a common touch , Stephen Hawking warned about climate change, opposed the US-led wars on Vietnam and Iraq, and supported universal health care. He also supported the boycott, divestment and sanctions (BDS) campaign against Israel and was a vehement critic of capitalism’s excesses, And Einstein was a pacifist, a human rights activist and a socialist. We should be grateful that two such brilliant scientists with well developed social consciences lived amongst us. The author seems underwhelmed by the pure (as opposed to the applied) scientific endeavour to understand the universe - the place in which we live. Perhaps he prefers the revealed truth. Newton, Einstein and Hawking amongst others will be remembered through history much as is Pythagoras although their memory will become invested in the mythology that comes with the myst of time much as with Moses, Jesus or Muhammad. Although this assumes that civilisation survives its own inventions; nuclear weapons, the human overpopulation of this planet (a combination of medical science and religious aversion to contraception) and profligate consumption of fossil fuel. What joy it was to hear Philip Adams (on ABC LNL 14.3.18) say, with audible emotion, something like: "Vale Stephen Hawking and thanks for clearing away some superstitions about this universe. I fondly imagine you passing through one of your beloved black holes and finding yourself in another universe, young and in complete health!" To this New Testament-believing Catholic Christian, Philip's eulogy sounded rather familiar. I mean, e.g. : "The Realm of God is close . . ." Amazing to hear an atheistic intellectual commending a departed outspoken atheist to what sounds like the promises of Christ! Yet, we're not universalists and last Sunday's Gospel Reading still resonates: "Whoever refuses to believe is condemned already, because they have refused to believe in the Name of God's Only Son." (John chapter 3). We obfuscate the entire Apostolic teaching when we imagine that any quantity of good works and clean living will merit eternal life. Without clinging to Christ's redemptive perfection none of us has the slightest chance of eternal life. Stephen Hawking and Philip Adams, like all of us, have had ample opportunity to seek for the Realm of God. Christ's guarantee is that if we genuinely seek, we will find Our Redeemer and so be made ready to face the judgement of King Jesus in Glory. Dear Philip - that's what is on the other side of the black hole of human death. And, it's God's grace that "By this Gospel you are saved." 1st Corinthians 15:2. The striking difference, to me, between Hawking and Einstein was that Hawking was an atheist, whilst Einstein was not. Einstein had a far greater ability to explain why he believed in a God, whereas, Hawking said nothing to support his non-belief. For that reason alone, for me, Einstein was a far greater thinker. Interesting comment, Peter Flood. What strikes me is that so many of the great intellectuals who believe in a God have a reason for believing, a proof which is to them valid, even though that proof may lie in their own inability to fathom the incredibility of what they understood of the creation they studied and explored. It is a proof steeped in humility and acceptance of something greater than themselves. I have yet to come across an atheist, however, who has promulgated a proof for the non-existence of God. Perhaps in the appreciation of their own intellects, they see themselves as supreme?? Hubris defeating humility?? STEPHEN HAWKING (2) Death comes snatching back a worn out body well past its time for claiming. A meeting-tryst held in abeyance by the ongoing advance of human techno-genius and your determined will! Stephen we celebrate the immensity of value and possibilities your one frail life has brought to this human journey. Here your uniqueness of mind held inextricably attached to this ultra-fragilty of body finds now an ultimate quietence. It's many achievements and unfinished potentials now assigned as the legacy of one on whose shoulders we stand and scan the future. So Stephen prophet and magus for this age of exponential discovery of complex uncertainty of immense anxiety. You go your way amidst the conundrums of our humaness whilst we similarly await our time for such an omega journey. But never with such illustrious and contrasting trajectories as yours. Stephen Your determination to live encourages us to use what we have for purpose beyond ourselves. For you Struggle and adversity now complete your legacy --- immense. Hawking was an a-theist .... in the sense of against the vision of a god presented by mainstream churches/religions who all talk of justice, but with no action. We are all too greedy to know the mind of God and cast our own human judgment on our fellow man in ther hear and now, simply because our outr own insecurities about having a ticket to heaven. Hawking abandoned that faithless security and opened himself up. Only heaven knows. Dear John Cranmer, I enjoyed the cadences of your elegant comment. Yet, find myself far from your "complex uncertainty of immense anxiety". What is complex or anxiogenic about: "You do not believe because you are no sheep of Mine. The sheep that belong to me listen to My voice; I know them and they follow Me. I give them eternal life; they will never be lost and no one will ever steal them from Me" (John 10: 26-28). What could be plainer or more assuring than that? The promises of science to explain everything have, in this very day, failed categorically (please view 'Humanitarian Cosmology', free on the web). At the cosmological level, the quantum level, the bio ecological level, and the anthropic level, human cognition has reached its limits. We have no future among the stars and are about to destroy the livability of our own planet. When will it ever dawn on us that our existence is about pre-eternal, ethical maturing; not about futile attempts at physically mastering the cosmos. We must stop confusing material trivia with what truly matters, before it is too late. Dr. Marty Rice, the anxiety is concerned with what is still unknown about our existence. It is the fear of not being in control. Our intellects are still expanding, and science is still evolving, so do not despair. Jesus said that the way to life is a narrow pathway, but its narrowness produces immense expansion in the way a singularity can ricochet outwards into an expanding trajectory. Death is a singularity which opens outwards into infinite love and boundless life, according to the teachings of Christ. Singularity ; physics mathematics; a point at which a function takes an infinite value, especially in space–time when matter is infinitely dense, such as at the centre of a black hole. Was Christ's Resurrection indeed a universal, cosmic event? I wonder what Mr Hawking thought of this possibility. Dear AO, good to see you setting the boundaries for scientific and theological disciplines. It's important to have a mutually-profitable dialogue but not the sort of mish-mash merger exploited by some popular preachers. In regard to: "Was Christ's resurrection a universal event?" 'Ethical Encounter Theology' (Griffith University PhD thesis free on line) offers evidence for an ethical cause for material cosmogenesis, itself intended to resolve the cosmic ethical anthropic problem without compromising freedom of choice. The New Testament is far in advance of its day in placing Christ's sacrifice prior to the Big Bang (e.g. 1 Peter 1:20; Revelation 13:8b; etc.). This inspired concept of time as simply an axis, greatly extended Old Testament cosmology and opened the way for us to see God providing the solution to the problem prior to the beginning of space-time/energy-matter. It also increases our appreciation of Christ as the alpha and omega. Peter's epistle explains: in this last age of time, we've been privileged to see the universal ethical cause-and-goal fleshed in our history; the divine pre- and post-universal visible as an actual human. Like Peter, both scientists and theologians have a plethora of reasons to love Jesus Christ . . .
Dear Dr Rice, thank you for your paper online. Science is simply the attempt to understand God's creation. All attempt to understand, and love God/ Christ, via any medium is meritable.